[toc]Dandruff is a very common problem faced by every person. It can be very embarrassing and irritating at times. You should start taking care of this problem in the very early stage so that the problem does not exceed to such a level that it goes out of control. You should be always careful while brushing your hairs and follow proper regime for maintaining the same. There are many medicinal shampoos and lotions available in the market for removing dandruff from your head. But, it is always better to go for natural remedies first. These natural cures are safe and also effective. You can use the natural elements from your surrounding for the same. Below, I will try to make you aware about a few natural cures for dandruff. This is a very simple and quick natural cure for dandruff. Take 2 lemons and squeeze out the juice from them in a small bowl. Now use this juice as oil to massage on the scalp. Leave it on the scalp for about 20 to 25 minutes. Later rinse off your hairs with a mild shampoo. Continue with this process every alternate day for a month for visible improvement. Later you may discontinue with this procedure. You will be a proud owner of a clean and clear scalp. This a bit long process, but worth giving a try. It is 100% effective and safe. Take handful of fenugreek seeds and soak them in adequate amount of water for a night. Grind it to prepare a smooth and slippery paste. 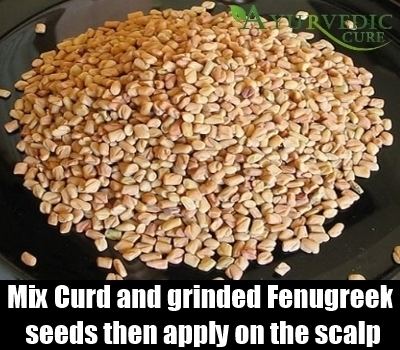 Mix 2 tablespoons of curd in it and apply on the scalp and hairs like a pack. Keep it intact for about 40 minutes and then wash off with cold running water. Later clean your scalp with a mild shampoo. Follow this process once a week for minimum 2 months to get fruitful result. 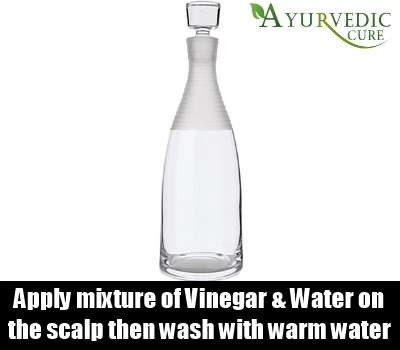 Vinegar is a natural cure for dandruff. Mix it with normal water in equal proportions. Firstly, wash your hairs with a mild shampoo and then use the above prepared solution to rinse your hairs and scalp. Wait for about 10 minutes before washing off the solution. Later wash off with normal water. You need to follow this procedure on alternate days for two weeks to get complete relief from the problem of dandruff. This is one of the oldest hair care regime which cures the problem of dandruff automatically. 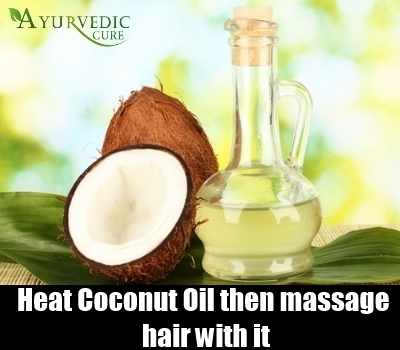 Take required amount of coconut oil in a small bowl and heat it up to a lukewarm temperature. Now use your fingers to massage your scalp with this lukewarm oil. Do this every night before going to bed. Keep this oil intact on your scalp overnight. You should clean away the oil with a mild shampoo the very next morning. Continue this for a month for expected result. 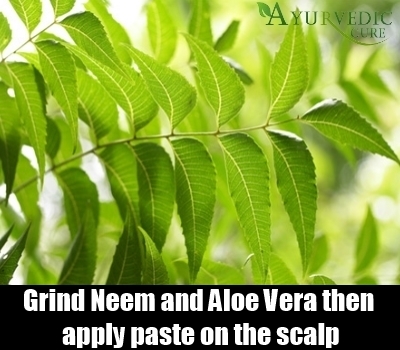 Take a handful of raw neem leaves and an aloe vera stem. Grind both the ingredients together into a smooth paste and apply it on the scalp. Keep this pack intact on the head for about half an hour. Later rinse off with mild shampoo. You have to follow this regime twice a week for about one month. This is a tested and safe natural cure for the concerned problem. Soon you will get a healthy scalp sans dandruff.